This is a photo of me and my great great grandpa Brian Barry who lived in Mosman all his life and still does with his wife Rose Barry. My sister Louise Barry is also in this photo. 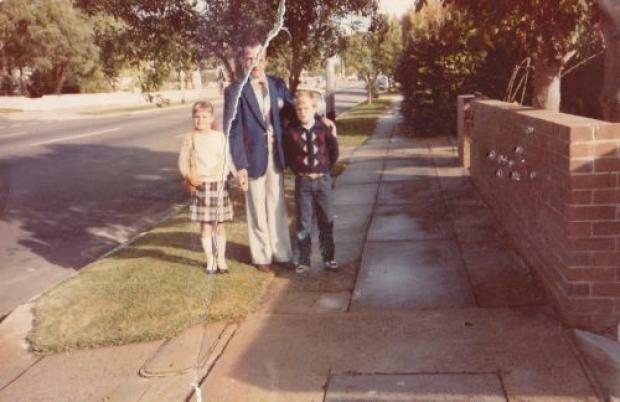 This is a photo of me and my great great grandpa Brian Barry and my sister Louise Barry is also there. My mum Susan Brown now lives in Anna Bay. I have alot more photos and stories that I will try and get from my family. What number in Ourimbah Rd. (I lived in No. 50 from 1947 – 1968). I was in the same class as Sue Barry during the 1950’s. I remember walking past her house each morning on my way to MHPS. I resided at #51 Ourimbah Rd. Lots of memories of those great years. Looking at these photos triggers memories of the people I went to school with. Susan Barry and Rod McCracken happen to be two on the long list as in those days over forty pupils in each class was the norm. I lived in Congewoi Rd and although I did not walk past this part of Ourimbah Rd on the way to school on the way to the shops in Roseberry St it was part of the trip.